Storage and Stability :Store desiccated at -20oC. Store solutions at -20oC for 3 months. 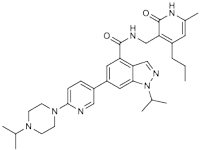 Scientific Background :UNC1999 is an orally active, highly selective inhibitor of both wild-type and mutant EZH1 and EZH2 lysine methyltransferases (IC50 = 45 nM and 2 nM respectively)1. Inhibition of EZH2 with UNC1999 enhanced the efficacy of gefitinib in suppressing the proliferation of colon cancer cells2. It suppresses global H3K27 trimethylation/demethylation and inhibits the growth of mixed lineage leukemia (MLL)-rearranged leukemia cells3.